Elevated triglyceride levels are a serious health problem, and this phenomenon cannot be ignored. People who care about their blood pressure and cholesterol levels are very well aware of what is going on. For those who are not familiar, we will tell how it comes to the increased amount of certain types of fats (lipids) in the blood, which can be a major trigger for many heart diseases. To maintain their level in the normal range, it is necessary first of all to lead a healthy life. If your diet is made up of foods rich in saturated fats, you certainly endanger yourself. Learn how the elevated triglycerides in the blood affect the overall health and how you can minimize them and naturally cure this condition. What are the symptoms of elevated triglycerides? 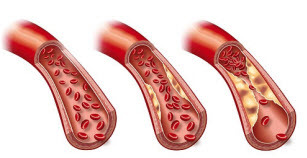 First of all, it is necessary to find out more about what are triglycerides. As we mentioned in the introduction, it is a specific type of fat found in the blood. When you eat food, the body consumes a certain number of calories. If their amount is greater than your need, they will be converted precisely in these lipids and transported in the bloodstream. This means that if you consume foods that are rich in carbohydrates, triglyceride levels in the blood will be higher. Therefore we immediately advised the reduction or elimination of these foods, because in that way you will keep your health and protect yourself from many diseases! But, not all triglycerides in the blood are bad, on the contrary – some are useful for us. It is necessary to maintain them in normal levels, because they serve our body as fuel for cells and tissues. They are particularly useful in times when we are hungry, as the deposits in the fatty tissue of the body burns. If you are already have increased level of triglycerides in the blood, symptoms that come with them are easy to notice. Specifically, they will be recognized with the changes of the skin on the buttocks, arms, shoulders. It most commonly occur in the form of deposits, which at first glance you seem like a pimple of red and yellow, and in particular it is easy to spot on the elbows and knees. These phenomena and the changes you will notice after just two hours after the intake of foods containing saturated fats and carbohydrates. What is characteristic is that they are visible for 12 hours thereafter. Of course, when it comes to elevated triglycerides in the blood, symptoms are best reflected through laboratory analysis. It is the only relevant way to determine the level of these fats. First, it should be noted that the cholesterol and triglycerides are two different but interrelated things. Specifically, these are separate types of lipids circulating in our bloodstream and it is quite normal that we all have them. As we said, triglycerides in the blood act as a reserve of energy for our body when we consume fewer calories than your body needs. On the other hand, cholesterol is used for the construction and renovation of cells in our body. You probably already know that there is good (HDL) and bad (LDL) one. The main difference is that the first one contains a greater amount of lipoproteins, and often it is said that this kind serves as a kind of "hunter" to LDL. When it comes to triglycerides normal value of these fats is 1.7 mmol / l or more than 150 milligrams per decilitre. Athletes and physically active people usually have these results in laboratory analysis. In terms of limit values, they can be considered acceptable or should be reduced, and those are 150 to 199 mg per decilitre, namely 1.8 to 2.2 mmol / l. Usually, these results may appear if an alcoholic drink or sweet was eaten prior to blood extraction. These are states in which elevated triglycerides levels were found to have exceed 2.3 mmol / l (high) and 5.7 mmol per litre of blood (very high). In these cases it is a serious health disorder that requires medical treatment and adequate therapy. As already mentioned, the disease that can occur as a result of elevated triglycerides are the heart and cardiovascular diseases. This is not an innocuous, given the fact that in this way you increase the risk of heart attack, and also atherosclerosis, and stroke can occur. Diseases of the liver and high triglycerides in the blood are directly linked because the increased levels of these fats leads to increased fat deposits on this organ. In particular, alcohol consumption is the main cause of this condition, especially if it is a continuous and daily intake of such drinks. To correct the triglycerides diet is essential. First of all, we recommend consuming foods rich in unsaturated fats, primarily in terms of olive oil, fish, tuna, salmon and herring. Fats should make up 25 to 35 percent of our daily intake of food. Make sure that you consume more nuts, because they are rich in omega-3 fatty acids, which are extremely healthy and necessary for your body. It is interesting that the potatoes contribute to the increased levels of triglycerides, it is desirable to reduce or completely avoid its use. Nutritionists say that, if there are elevated triglycerides in the blood, the diet must be conducted in an adequate manner. It is therefore generally advisable avoiding potatoes because it is rich in starch, but you can always eat Jerusalem artichokes which are healthier. If you are interested in how to reduce triglycerides diet, you definitely have to mention a few important things. Namely, when it comes to meat products, be sure to consume chicken and turkey, and avoid pork, red meat. From fruits apples, strawberries, cherries, lemons, blackberries and blueberries are allowed. On the other hand, do not eat grapes (especially dry), figs, as well as any kind of candied fruit. From dairy product use only skimmed milk, yogurt and cottage cheese. It is not advisable to eat cream, butter and other types of cheese. Finally, drinks are allowed to be consumed like tea and coffee but do not add sweeteners. Avoid chocolate milk, juices and soft drinks, and of course alcohol. What is the best natural remedy for triglycerides? The good news is that natural remedy for triglycerides can be found all around us, but before that, we will give you a few tips that will help in reducing their levels in the blood. The 2.5 dl of boiling water add a tablespoon of leaves, cover and leave to rest for a few minutes. Beverage should be drunk while warm. More recipes and information on this gift of nature in the article healing properties of green tea. First of all, if you suffer from excess weight and you need to lose weight as soon as possible. If you lose 5 to 10 pounds, you will do a great thing not only for your physical appearance but also for your health. After all, cholesterol levels will be lower, but the weight loss will reduce triglycerides naturally, easily and efficiently. You need to know how your body through food takes calories to use as energy for daily activities. However, if you enter more food, therefore you will increase the number of calories and in this way you may elevate the number of triglycerides. Following up on the previous paragraph, because they are directly related. Apart from smaller caloric value, it is important to avoid foods rich in saturated sugars. In addition, it is known that white flour is a major trigger for the increase of fat in the blood. Be sure that you reduce triglycerides naturally if you are consuming alcohol. Do you know that only 30 minutes of physical activity on a daily basis is the best way to reduce triglycerides naturally? Regular exercise contributes to increasing the level of good cholesterol, and even a daily walk can be of a great benefit. Go walk to work, cycling, from time to time swimming and you will feel much better. It is very important to adhere to this advice. If you suffer from greater levels of blood fat, it is very helpful if you have green tea for cholesterol and triglycerides. It is a completely natural product available in almost all supermarkets and health food stores. Drink two cups a day and you will be satisfied with the results. For those who in turn do not like the taste of this drink, lemonade may be helpful. It is known that lemon cleanses the blood vessels of the excess fat and helps with weight loss. This is a great way to detoxify the body, so it is best to consume one cup every morning on an empty stomach. If necessary, you can add honey to increase the effect of lemon. Elevated triglycerides during pregnancy is something that every expectant mother may face. Slightly increased levels of these fats is normal, so there is no cause for panic. The baby needs more lipids in order to develop properly (especially when it comes to brain and) are therefore we can see elevated triglycerides in the blood during pregnancy, your body's reaction to the needs of babies. General advice for all pregnant women is to prepare food in olive oil and avoid canned foods and to eat honey. When it comes to high triglycerides in the blood, the experiences of people who are faced with this problem are mostly unpleasant, because everyone was afraid of a heart disease. Even greater concern is present in people with a genetic predisposition to heart disease and cardiovascular system. If you belong to this group, you need to know that there is no cause for panic. Follow the advice that we shared with you and be sure to see your doctor. Be sure to avoid starvation, because it will not be useful, because you can do more damage to your body. Therefore, match the food according to the list of allowed foods and do not give up in order to help yourself and your health naturally. At the very end, once again we repeat that the main prerequisite for keeping triglyceride levels normal is keeping a healthy lifestyle. Regularly visit your doctor and use the prescribed therapy, and with it eat healthy and be physically active. Your body will react positively and thereby reduce the risk of many diseases of the heart.